The Spot Light entity lights a scene from a point within the 3D scene and emits light in one direction. The light emited is constrained to an angle and results in a cone of light being emitted across the scene. Like a Point Light, the light intensity reduces with distance from the light source. Spot Lights are useful for simulating artificial light sources, such as flashlights or car headlights. Spot Lights need to be positioned within the 3D scene. When added to a node, you need to move the node into the position you require. With the node selected, the Spot Light points in the direction of the blue arrow (forward direction) on the node. You can control the direction of the light source by changing the direction of the blue arrow. The color will change based on the values of the properties below. Color will show you the color of the light you are creating. Intensity (brightness) controls how bright the light will be. The higher the number, the brighter the light source. Enter any number in this property to change the intensity. The Falloff Exponent is how quickly the light diminishes/disappears from the light source. 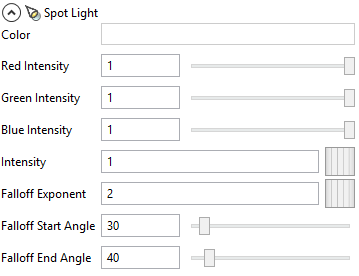 The falloff exponent is used in the lighting calculation. 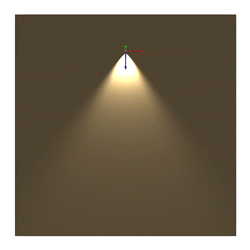 The Falloff Start Angle is the angle of the spot light and the point at which the light starts to disappear. Enter an angle in Degrees. The Falloff End Angle is the angle at which the light fades to nothing from the Spot Light. 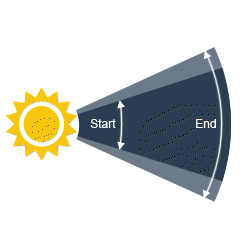 The light will fade from the start angle to the end angle with the light disappearing at the end angle. Enter an angle in Degrees. 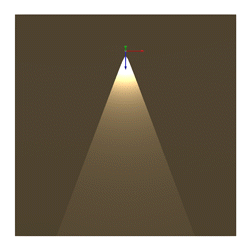 Setting the Start Angle and the End Angle to the same value results in a sharp cone of light from the Spot Light. Having the End Angle greater than the Start Angle lets the light falloff smoothly at the edges. 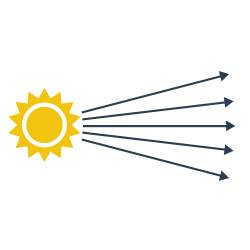 The Falloff End Angle is the angle at which the light fades to nothing from the Spot Light.The light will fade from the start angle to the end angle with the light disappearing at the end angle. 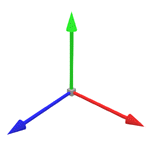 Enter an angle in Degrees.